The touchscreens in cars I've tried up to now have largely been frustrating--herky-jerky, hesitant. You jab the screen repeatedly and glance over (which you're not supposed to do) to see what the holdup is. That's because most of these touchscreens use resistive technology, which is notoriously unresponsive. A shining and nearly unattainable exception is the Tesla Model S, with its gorgeous, 17-inch touchscreen control panel. But now there's hope on the budget end of things. The 2014 Kia Soul (starting at $14,900 MSRP) has a massive 8-inch touchscreen that's capacitive, like the one on your smartphone. The result? It's a lot more responsive. But isn't it still distracting when you can't feel a dial spin or a button push? Surprisingly, no. 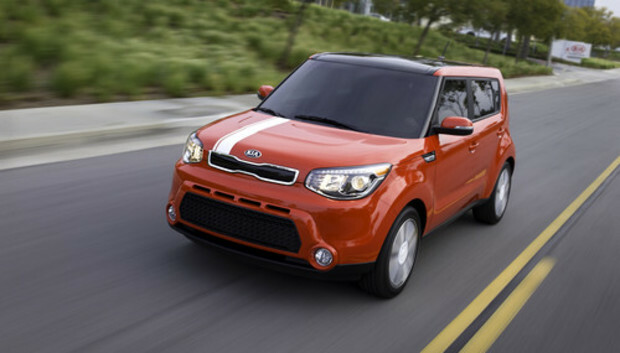 Far from a distraction, the 2014 Kia Soul's touchscreen was a helpful driving aid that worked reliably and consistently. In the navigation screen, it was easy to swipe on a map all around a geographic area. In a car whose touchscreen is less responsive, there's a slight delay, or the map jumps suddenly over to the next highway. But not in the Soul. After connecting an iPhone 5s, it was easy for me to upload a song list to the display and swipe through artists and songs. The list didn't jerk suddenly or pause--it felt just like swiping through the same list on the iPhone itself. The Pandora app, which syncs with your phone but shows most features on the touchscreen, including a skip-track button, also responded well to one finger press. Kia gets bonus points for combining features into one main view. For example, you can see the navigation map and the current song on one screen. Kia also improved the display above the steering wheel: It now looks much more readable. Kia kept some features analog: there are physical buttons for increasing airflow or turning up the seat heater, for instance. But if more new cars can nail the touchscreen display, making it responsive and useful, they can start adding more features without compromising convenience or safety. Even some aftermarket vendors are getting into it: Pioneer's NEX line of infotainment systems offers a capacitive display on its highest-end unit.